My aims are to carry as little as possible, but at the same time be self-sustainable. I know, these two goals somewhat contradict each other. However, I want to be able to cycle in areas with little to no human habitation. That means bringing complete camping gear, as well as water purifier, e.g., but also a long list of spares and tools to repair pretty much anything on my bike and gear. The following list is not exhaustive (yet), but I am getting there: clothing, camping gear, electronics and my bike setup. In essence, I carry one set of clothing for cycling (many layers, to adjust for a wide range of temperatures) as well as one set of clothing for sleeping / time at camp. The latter is also functional clothing, such that I can also use it as a spare for cycling if all of my cycling gear is drenched and does not get dry. I have been grateful to have packed clothing for a wide range of climates, as I have encountered anything from freezing nights in the mountains where the temperature dropped below -20°C to deserts where the thermometer topped +45°C. If you use this list as an inspiration, adjust accordingly to the climates you will likely encounter. Again, this is a list that reflects what is important for me personally on my tour – being able to express myself as a writer and photographer, as well as to have enough redundancy and emergency devices for very remote areas. For many tours, this will not be necessary. As people ask me frequently about my choice of a tablet instead of a laptop: much lighter and smaller than a laptop, with stunning battery service life of nearly 16h and, most importantly, chargeable with my bike dynamo (via a battery pack and USB). My bike Emily is the result of a long thought and research process: custom-built according to my specifications by a small group of bike enthusiasts in Berlin. No tour is the same and no person, so Emily’s setup will not fit everyone and every tour. 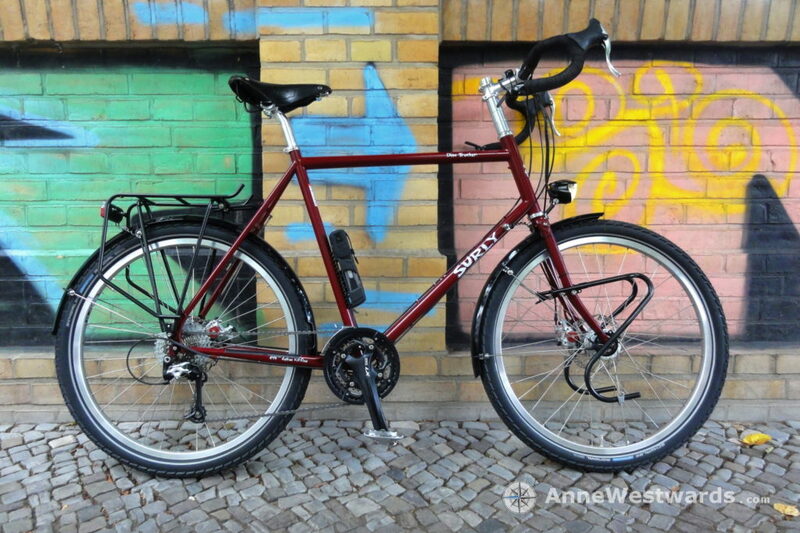 I wanted her to be very durable, a sturdy bike for roads as well as rough terrain, suitable for heavy loads and for the mountains, with parts that I can repair myself and for most of which I can find replacements also outside of Europe / North America (if not, I carry spares). If you have any questions concerning the choices, please do not hestitate to contact me. I’ll be happy to explain my reaosons behind the components. In brief: Disc Trucker frame by Surly, disc brakes, 26” wheels, dropped handlebars, 10-speed drive train, mostly Shimano components, carrying system for 6.5l water/fuel on the frame. As I mentioned, this list is long to enable me to be self-sustainable also in countries with very remote stretches – countries that may have one bike shop in the capital, but nowhere else. Not every tour will need such a wide range of spares and tools, of course. As spares, I usually carry the same models that I already have on my bike. My gear is work in progress. The choices are tough – these are going to be my travel companions for months on end. While there items that always have found a spot in my luggage and will again (my travels have been accompanied by the same, reliable functional sweater since 2002), there are others that are still up for debate. The single most important piece of gear I already have; Emily, my trusted companion for this trip. A tough touring bike, custom-built around the Disc Trucker frame by Surly. Emily is the result of a thought and learning process – after all, I originally set out with very little knowledge about the requirements for touring bikes. Thus, I spent many weeks researching, reading, discussing about every single component – and the result is Emily. Even though I have only cycled on her for a bit more than a month now, I am already in love with her! And yes, my bike is female. I decided that this is a trip among women.